91 years of innovation and technology for our customers. 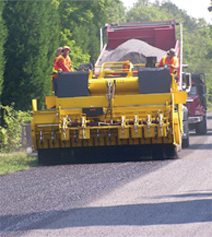 Hammaker East LTD has been providing the community with quality asphalt emulsion products and services at since 1923. A subsidiary of Russell Standard Corporation, Hammaker East maintains offices in Fayetteville, PA with operations that include plants in Chambersburg, PA, Baltimore, MD, Black Mountain, NC, and Greensboro, NC. Acquired by Russell Standard in 1992, the company is a leading provider of paving materials and services for the road construction industry. With a highly trained and dedicated team, we meet our customers’ ever-changing needs and enable them to build a better infrastructure in their communities. We specialize in asphalt maintenance, preservation and repair in addition to offering a full range of asphalt emulsions, hot and cold asphalt mixes, and asphalt protective coatings to state and local governments and contractors who are performing their own paving projects. For over ninety years, Hammaker East has built a strong reputation for providing unique and innovative specialty products, along with the customer service and technical support to ensure successful project completion.